Objectives: To test the effectiveness of a physiotherapist delivered intervention designed to prevent urinary incontinence among women three months after giving birth. 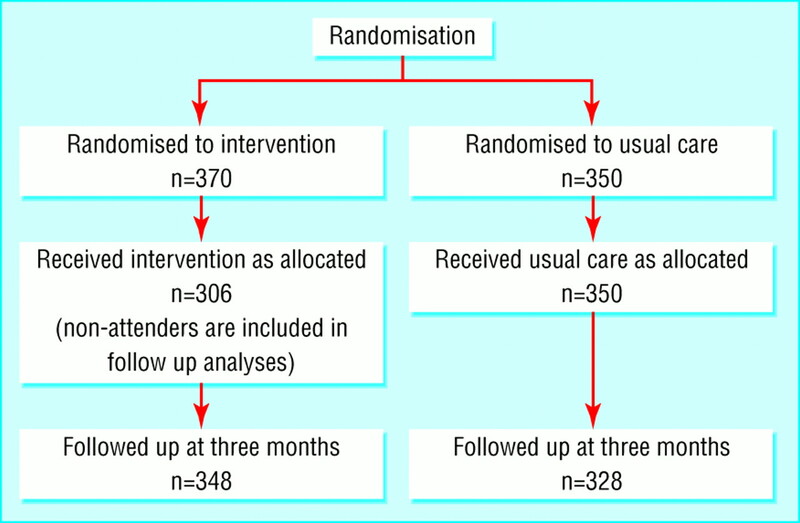 Design: Prospective randomised controlled trial with women randomised to receive the intervention (which entailed training in pelvic floor exercises and incorporated strategies to improve adherence) or usual postpartum care. Setting: Postpartum wards of three tertiary teaching hospitals in the Hunter region, New South Wales, Australia. Participants: Women who had forceps or ventouse deliveries or whose babies had a high birth weight ( 4000 g), or both—676 (348 in the intervention group and 328 in the usual care group) provided endpoint data at three months. Main outcome measures: Urinary incontinence at three months measured as a dichotomous variable. The severity of incontinence was also measured. Self report of the frequency of performance of pelvic floor exercises was recorded. Results: At three months after delivery, the prevalence of incontinence in the intervention group was 31.0% (108 women) and in the usual care group 38.4% (125 women); difference 7.4% (95% confidence interval 0.2% to 14.6%, P=0.044). At follow up significantly fewer women with incontinence were classified as severe in the intervention group (10.1%) v (17.0%), difference 7.0%, 1.6% to 11.8%). The proportions of women reporting doing pelvic floor exercises at adequate levels was 84% (80% to 88%) for the intervention group and 58% (52% to 63%) for the usual care group (P=0.001). Conclusions: The intervention promoting urinary continence reduced the prevalence of urinary incontinence after giving birth, particularly its severity, and promoted the performance of pelvic floor exercises at adequate levels; both continence and adherence to the programme were measured at three months after delivery in women who had forceps or ventouse deliveries or babies weighing 4000 g or more. Our study aimed to test the effectiveness of a programme for preventing urinary incontinence in women at three months after delivery. The intervention incorporated exercises to strengthen the pelvic floor and established principles of health promotion to encourage adherence to the programme. The study hypothesis was that, in a randomised controlled trial of an intervention that promoted continence and was delivered by physiotherapists, the prevalence of urinary incontinence among women in the intervention group would be lower than among women in the usual care group. The study, a randomised controlled trial, was conducted in the postpartum wards of three hospitals in the Hunter region, New South Wales, Australia. These were a 580 bed metropolitan public teaching hospital with 3208 births a year, a 68 bed metropolitan private hospital with 962 births a year, and a 170 bed rural public hospital with 1150 births a year. Data were collected between August 1998 and February 2000. Ethics committees of the Hunter area health service and the University of Newcastle granted approval for this study. Women were eligible to join if they had had forceps or ventouse deliveries or their babies had had a birth weight of 4000 g or more. The estimated prevalence of urinary incontinence after delivery is 7-30%13 14 15; for sample size calculation we assumed a prevalence of 30%. To detect a 10% difference between intervention and control groups at =0.05 and =0.80, and using the formula given by Pocock for two sided comparisons, a final sample of 290 women who fitted the criteria was required in each group.16 The reduction of incontinence from a prevalence of 30% to 20% corresponds to an odds ratio of 0.58. Allowing for a 20% dropout, we needed to recruit about 350 women in each group. The intervention was multifaceted and is shown in figure 1. The intervention was underpinned by the framework of the health belief model (http://hsc.usf.edu/~kmbrown/Health_Belief_Model_Overview.htm), included strategies to improve compliance, and was developed by using a consensus of expert opinion and input from women in the target group.17 18 19 Compliance strategies included tailoring the exercise programme to the functional abilities of each woman's pelvic floor muscles and negotiating with the woman about the most convenient times for her to carry out her exercises. Each woman was given a poster and sticky red dots to place in relevant places (to serve as reminders to do the exercises) and was offered an information sheet for her partner. Similar techniques from social marketing and health promotion were used to develop an eight page, A4, bifold booklet designed specifically for this intervention. This booklet included information about pelvic floor exercises, educational material about the function and structure of the pelvic floor, the effects of childbirth on the pelvic floor, perineal care, good bladder habits, and instructions about avoiding constipation. All diagrams and the text used in the booklet were pretested to ensure readability, acceptability, and relevance to the target group. Eligible women were approached on the ward by one of three physiotherapists, usually within 48 hours of delivery. Consenting women completed a structured interview that elicited information on sociodemographics and experiences of urinary incontinence before the pregnancy and after delivery. After this, women were randomised to either a control group receiving usual care or the group receiving the intervention. A computer generated randomisation list contained the identification numbers for women in the trial. The allocation to intervention or control group was placed by a research assistant in a sealed opaque envelope marked with the corresponding study identification number. The physiotherapists were blinded to the woman's allocation until the structured interview was completed. At this point, the envelope was opened and the woman was told that she had been allocated (by chance) to either the intervention or the usual care group. The women randomised to the intervention group were seen by the physiotherapist once during their stay in hospital and 306 women were seen again for a single visit with the same physiotherapist at eight weeks after delivery. The components of the eight week intervention are shown in figure 1. The visit occurred at either the hospital (205 (67%) women) or the woman's home (101 (33%) women) if transport was a problem. The intervention in hospital required about 20 minutes of the physiotherapist's time, and the follow up visit was completed in about 30 minutes. The usual care group received routine postpartum care, which did not include a visit from a physiotherapist. A brochure produced by the hospital was made available to all these women while in hospital. This outlined general postpartum and pelvic floor exercises, along with an invitation to join the routine physiotherapy postnatal classes held in the wards. No restrictions were imposed on women in undertaking any postnatal exercises that they chose to do or were recommended by other healthcare professionals. All participants were interviewed by telephone three months after their recruitment into the study. The interviewer was trained by PC and was blind to the group allocation of the women being interviewed. Women were also sent a bladder diary before this interview. They were classified as incontinent if they responded “occasionally,” “often,” or “always” to any of the items. The first item in the list relates to stress incontinence whereas the others relate to urge incontinence.20 The questions have been shown to be valid when measured against two tests performed at home by women using pads for two hours and for 48 hours and to be acceptable to women immediately after delivery. 21 22 The International Continence Society recommends the use of a bladder diary to validate self reported measures.20 In our study women completed a three day bladder diary before the follow up survey to improve recall. Performance of pelvic floor exercises—Women were asked if they were performing pelvic floor exercises. Response options were “never,” “less than once weekly,” “about once a week” (categorised as inadequate levels), “a couple of times a week,” “daily,” or “more than once a day” (categorised as adequate levels). Personal characteristics—Age and body mass index were ascertained from women's medical notes. Women were also asked about urinary incontinence at times other than during pregnancy and since the baby was born. If they answered “yes,” the five items listed on the self report measure already described were used to determine the type of incontinence that they had experienced. Perineal status—The perineal status of the women was determined from the birth register as an intact perineum, a graze, a tear (not sutured), a tear with sutures, an episiotomy, or an episiotomy and a tear. If women had a tear with sutures, the degree of the tear (second degree, third degree, fourth degree) was noted. Type of delivery—The type of delivery was categorised according to whether instruments were used or not. The effectiveness of the intervention was analysed by intention to treat. Logistic regression, using continence status at three months as the outcome measure and including the intervention group as a predictor variable, determined the effect of the intervention while controlling for any residual confounding from variables specified a priori. Mantel-Haenszel 2 statistics were used to test for a significantly increasing trend in the proportions of women exercising at adequate levels between the intervention and control groups. During data collection, 1326 women fitted the description for the reference population and formed the source population for this study (figure 2). Of these women, 913 were approached and 720 consented to take part. This gives a response rate of 54.3%—the proportion of women in the final sample from the available source population. The consent rate of 78.9% represents the proportion of women in the sample from the women approached overall. No significant differences were found between the overall mean age and number of births of the women in the study and women who were missed, transferred out, or not approached to participate. Although the differences in mean age (3 years) and mean number of births (0.4 births) between the private and public hospitals were statistically significant, they were not considered to be of clinical significance. Women were seen on average on the second day after delivery (range 0-10 days). Only one woman was seen 10 days after delivery. The day after delivery was when most women were seen. Table 1 shows the demographic characteristics and number of pregnancies of women in the control and intervention groups. Table 2 shows the factors identified a priori as potential confounders for the study in each of the groups. Compared with Australia's perinatal statistics, except for number of births and education, the sample characteristics are similar to the national norms. Compared with the national statistics, our sample had a higher proportion of primiparous women (53.5% v 39.7%) and a lower proportion of women with four or more births (5.3% v 9.9%). Between being seen in hospital and the follow up telephone call at three months, 22 women each (6%) dropped out of the intervention group and the control group. Sixty four women in the intervention group did not attend the follow up visit at eight weeks. As we are analysing by intention to treat, these 64 women were included in the outcome analyses. At three months post partum, the prevalence of incontinence in the intervention group was 31.0% (108) and in the usual care group 38.4% (125) (difference 7.4% (95% confidence interval 0.22% to 14.6%, P=0.044). Table 3shows the results of the logistic regression analysis. After residual confounding was controlled for, the odds ratio of incontinence for women in the intervention group compared with the control group was 0.65 (0.46 to 0.91, P=0.01). The experience of incontinence before the most recent pregnancy and continence status immediately after delivery also had an independent significant effect on continence status at three months. At three month follow up a significantly lower proportion of women who had mixed symptoms (symptoms of stress incontinence together with symptoms of urge incontinence) had severe symptoms in the intervention group than in the control group (10.1% (35 women) v 16.8% (55 women); a difference of 6.7% (1.6% to 11.8%) (P=0.01). The two groups differed significantly in regard to the performance of pelvic floor exercises three times per week or more (P=0.001). In the usual care group 189 women), 57.6% (52.3% to 62.9%) and in the intervention group (292 women, 83.9% (80.0% to 87.8%) of women reported performing pelvic floor exercises at adequate levels, a difference of 26.3%. This is the first study to show that an intervention delivered to women in the immediate and early post partum reduces the likelihood of urinary incontinence three months later. The finding that women in the intervention group were significantly more likely to be performing pelvic floor exercises at adequate levels during the three month period after giving birth strengthens the causal role of the intervention. Firstly, the results of the main effects of the intervention are of marginal statistical significance, with comparatively wide confidence intervals. When residual confounding was controlled for in the logistic regression, however, the strength of the association increased slightly. We analysed by intention to treat. It is possible that the effect would be strongest among women who participated in all components of the intervention. Secondly, we need to consider the external validity of the study, as the sample was drawn from only three hospitals. But these hospitals—urban public, urban private, and rural—served diverse population groups. Thirdly, the response rate indicated that only just over half of women who might have participated in the study actually did so. The fact that women were missed is a reflection of current practice in many maternity hospitals in Australia. Women are encouraged to leave hospital within hours of delivery, with home support provided by visiting midwives; women with private health insurance usually choose to convalesce in private hospitals. We did not approach women who had had a stillbirth or a baby in neonatal intensive care, women who had a disability that meant that they could not perform pelvic floor exercises, women who were not residents of Australia, and women who could not speak English sufficiently to give consent. As 79% of the women approached agreed to enter the study, however, bias due to non-consent was minimised. Women were not blinded to whether they were in the intervention or the control group. They were, however, explicitly told that the study was not measuring their personal individual exercise practice in any punitive fashion but rather whether the intervention helped them to remember to do their pelvic floor exercises. In spite of this, women might have felt socially pressured to admit to exercise levels above those that they performed. Another consideration is that levels of pelvic floor exercise were measured by using self report, which could lead to social desirability bias in the intervention group. There are, however, few, if any, alternatives for monitoring the performance of this type of exercise accurately. The study also had several strengths. Firstly, we used a randomised controlled design. Secondly, the sample size was sufficient to detect a difference of around 8% between groups as significant. Thirdly, the data were analysed by intention to treat. Randomised controlled trials are highly idealised and do not mirror real clinical practice. As this study set out to examine how effectively the exercise programme was adhered to, the lack of adherence to exercise by the women in this study gives a realistic outcome that mirrors the potential for the performance of pelvic floor exercises among women who have recently given birth. The findings have several important implications. Firstly, many women experienced incontinence after delivery. The data from the usual care group show a prevalence of urinary incontinence of 38.4% among women who had forceps or ventouse deliveries or whose babies had a birth weight of 4000 g or more. Secondly, the intervention seemed to have most effect on women with severe mixed incontinence. Although it is difficult to offer a reason for this outcome, it is important to note that urinary incontinence was based on the symptoms experienced by the women in this study and no urodynamic assessments were carried out. These results could, however, be the effect of the information regarding good bladder habits that was given to women in the intervention group. Thirdly, it is likely that the intervention was successful because it was based on established theories of behaviour change, incorporated known principles of anatomy and physiology, and included input from consumers in its development. Since dropout rates have been shown to be high among postpartum women performing pelvic floor exercises, the use of behavioural principles seems to have encouraged adherence to the exercise programme and the performance of such exercises. That the programme was designed to exercise specific muscles and fit in with the normal daily routine of the women may have added to its acceptability. The effect of these components in women who have given birth needs to be studied in the longer term, and follow up assessment is planned at 12 months post partum. If this programme was disseminated among and taught to women by physiotherapists, this could result in the promotion of continence in the wider population. Although the intervention in this study was delivered by physiotherapists, who used their considerable specialist expertise in prescribing exercise programmes, other health professionals such as midwives and primary care physicians could be trained to carry out the different parts of the intervention—midwives immediately after the delivery and physicians or midwives at a postpartum visit. Contributors: PC carried out the study as part of the research undertaken for her PhD. JC was PC's PhD supervisor and is the guarantor for the study. Funding Medical Benefits Fund, Physiotherapy Foundation, and University of Newcastle Research Management Committee. .Prevalence of urinary incontinence among women at a Swedish primary health care centre.Scand J Primary Healthcare1990; 8:203–206. .Exercise and incontinence.Obstet Gynecol1990; 75:848–851. .Effect of urinary incontinence on sexual activity in women.J Reprod Med1993; 38:679–683. .Urinary incontinence and psychological distress among older adults.Psychol Aging1988; 3:115–121. .Urinary incontinence in women and the effects on their lives.Scand J Primary Health Care1992; 10:211–216. .Leaking urine: prevalence and associated factors in Australian women.Neurourol Urodynam1999; 18:567–577. .Impact of urinary incontinence on healthcare costs.J Am Geriatr Soc1990; 38:292–295. .Economic costs of urinary incontinence in community-dwelling Australian women.Med J Aust2001; 174:456–458. .5 year follow up of pelvic floor muscle exercise for treatment of stress urinary incontinence.Neurourol Urodynam1994; 13:374–376. .Pelvic floor training for genuine stress incontinence.Br J Urol1993; 72:421–427. .Prevalent urinary incontinence as a correlate of pregnancy, vaginal childbirth and obstetric techniques.Am J Public Health1999; 89:209–212. .Obstetric risk factors for stress urinary incontinence: a population based study.Obstet Gynecol2000; 96:440–445. .The symptom of stress incontinence caused by pregnancy or delivery in primiparas.Obstet Gynaecol1992; 79:945–949. .Obstetric practice and the prevalence of urinary incontinence three months after delivery.Br J Obstet Gynaecol1996; 103:154–161. .Urinary incontinence across the lifespan.Neurourol Urodynam (in press). .Statistical aspects of a clinical trial design.The Statistician1982; 31(1): 1–18. .Bringing the models together: an empirical approach to combining variables used to explain health actions.J Behav Med1980; 3:123–145. 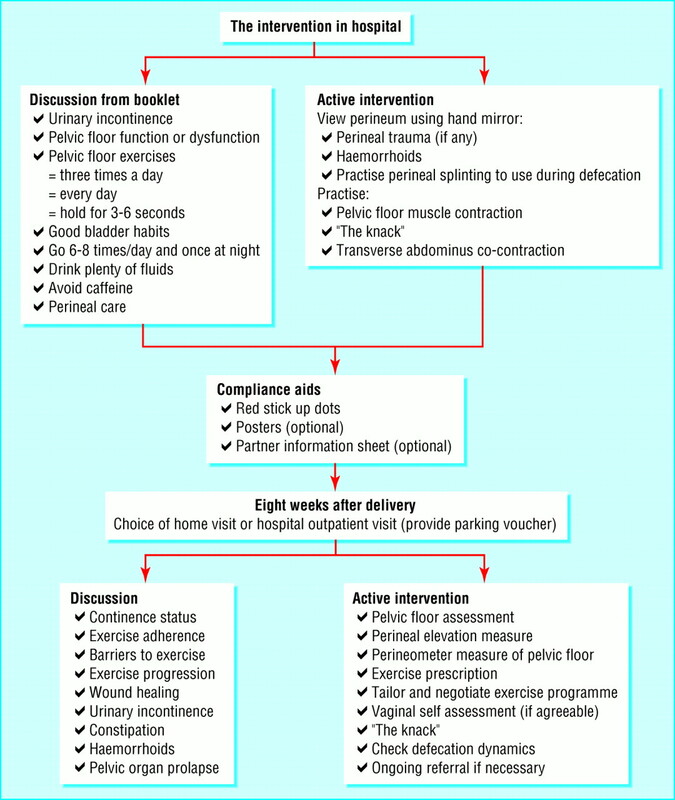 .What the experts said: developing a post partum continence promotion program.Aust Continence J1999; 5:41–42. .The development of a physiotherapy continence promotion program using a customer focus.Aust J Physiother1999; 45:111–120. .First report on the standardisation of lower urinary tract function. Urinary incontinence. Procedures related to the evaluation of urine storage: cystometry, urethral closure pressures, units of measurement.Br J Urol1976; 48:39–42. .The development of a GP-based treatment program for women with urinary incontinence [doctoral thesis]. Newcastle, 1998. .Incontinence during pregnancy. Prevalence and opportunities for continence promotion.Aust N Z J Obstet Gynaecol1997; 37:66–73. .Validation of a severity index in female urinary incontinence and its implementation in an epidemiological survey.J Epidemiol Comm Health1993; 47:497–499. .Short forms to assess life quality and symptom distress for urinary incontinence in women: the incontinence impact questionnaire and the urogenital distress inventory.Neurourol Urodynam1995; 14:131–139. .Stress incontinence of urine: a connective tissue problem?Physiotherapy1994; 80:143–144. .A study of paraurethral connective tissue in women with stress incontinence of urine.Neurourol Urodynam1990; 9:319–320.